Besides having just down right good food, Rose Hammitt and I enjoyed the atmosphere at Lynch’s Irish Pub in Jacksonville Beach. Curious about the dollar bills with names that appear on almost every empty spot in the ceiling and other sites, we asked our server about them. “They are markers, wishes,” she replied simply. Two days in a row we found ourselves seated at the high seats sharing a meal big enough for two mulling over whether or not to add a dollar of our own to the collection. 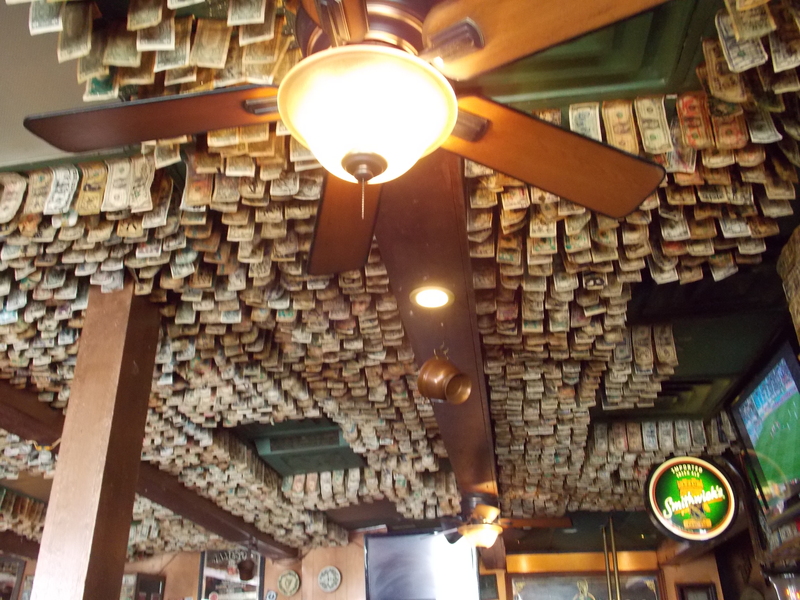 With staff that our server said “Are like family” the dollar bills mostly stay in place. It makes a girl curious just what the markers have been for, what wishes have come true while listening to the lilting Irish tunes that are unexpected in a beach community. We surely enjoyed the hospitality and found this a great place to take a moment sit back before heading out again. We may not have left a dollar behind, but we took memories and thoughts of those that left their wishes tagged for all to see. Log onto http://lynchsirishpub.com/ for details!